Archdiocese of Wellington – Leadership Formation Programme Re-loaded! Home » Wel-com » Leadership Formation Programme Re-loaded! WelCom July 2017: Life looks a whole lot different now for the participants in a re-gathering that took place over Queen’s Birthday Weekend. The Leadership Formation Programme (LFP) ran in the Archdiocese of Wellington between 1997 and 2009. During those 12 years more than 250 young people aged between 18 and 25 years participated in an open-minded and critical forum of learning about ‘what Catholics believe today’. Now all aged between 25 and 45 years, 53 of them got back together to ask similar questions at a very different stage of their lives. Single, married, defacto relationships, separated, parents – the group was a microcosm of the contemporary Church with discussion that was welcoming, upbeat and full of hope. Saturday midday saw over 20 families gather in Lower Hutt’s Avalon Park for a picnic. Parents regrouped with just the babies, for a forum and Mass with Cardinal John Dew, back at the Mercy Conference Centre in Wellington. There in our own upper room, we celebrated Pentecost in a manner that will stay with us. The atmosphere was alive and dynamic with old friends meeting up after many years. Participants who had shared so much back in the LFP days found it fascinating to see where life had already taken the others. 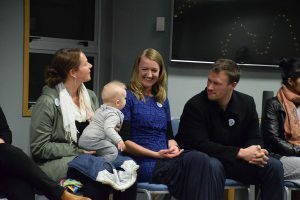 Faith formation, good humour, a shared meal, wine and socialising – it was a winning recipe that ended with a final focus on our home and family relationships. Chapter Four of Pope Francis’ Amoris Laetitia was distributed to all to take away and ponder. With real interest in how to do faith in the home and another 50 or so apologies received, there is to be follow-up that goes beyond the LFP graduates. The Family and Young Church Vicariate is already planning. Watch this space!